Located about two and a half hours from Singapore is a popular getaway beach destination - Bali. I stayed at the Conrad Bali and spent three days at this fantastic property. I contacted the hotel to arrange for transport from the Ngurah Rai (Denpasar) International Airport for US$22 each way (per vehicle). Alternatively, you may choose to flag down one of many taxis for a cheaper rate (approximately US$8 - 10). 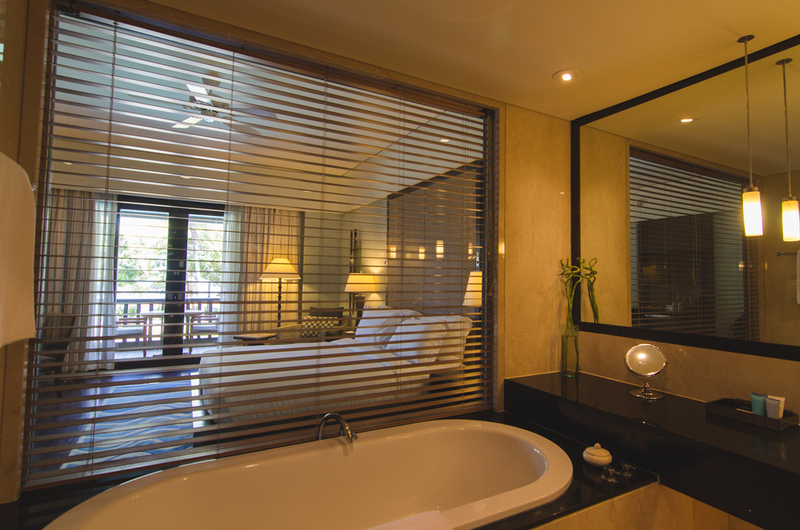 The hotel is located at Nusa Dua, which is away from the usual Kuta haunts in Bali. As such, the beaches are a lot quieter but that also equates to being further away from the action and having to spend more time commuting to popular destinations. I was greeted with the magnificent view of the property when I arrived as I enjoyed my welcome drink whilst the front desk prepared for my room. The main swimming pool being next to the beach has an amazingly therapeutic effect. Since the official check-in time is 3PM and it was only 2PM when I arrived, I was escorted to the Reflections Lounge to wait. 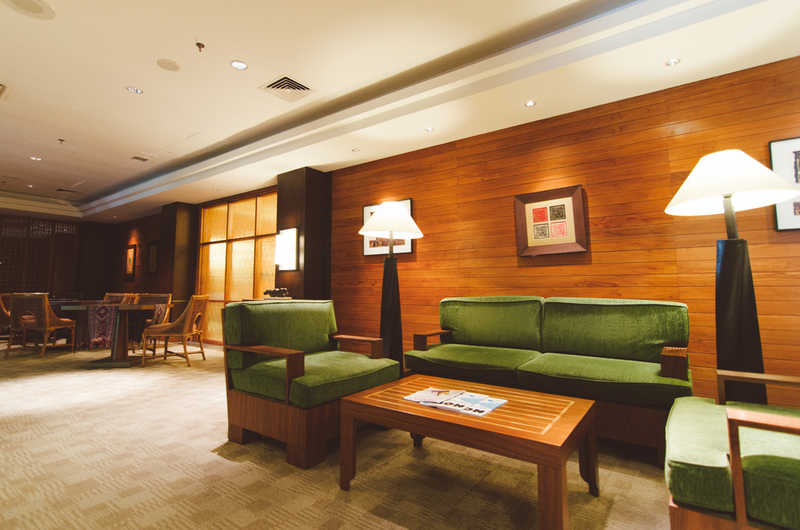 The lounge was located near Jiwa Spa and the private Conrad Suites area. Whilst the staffs were really polite, perhaps drinks and snacks could be offered to hotel guests waiting for their rooms to be ready. My Hilton Gold status did nothing for me during this stay since the rate at which I booked at (Grand Voyage) offers a guaranteed one-level upgrade. I have also received 10,000 bonus HHonors points as part of the package. Alternatively, you may consider the Conrad Spa package (complimentary massage for stays over 2 nights). Shortly after, my room (Deluxe Ocean View) was ready and I was being escorted by another staff to my room following a quick visit to the front desk. The walk from the main entrance to my room was slightly far away but I was greeted with a spacious room with the (much needed) air-conditioning turned on. The room also came with a deep bath tub alongside premium amenities from Shanghai Tang (click here to find out more about Shanghai Tang's range of soaps) , Tara Smith and the Aromatherapy Associates. Overlooking the lagoon and the ocean from my balcony, this was a much desired break away from the noise of every day's life. I highly recommend getting the Conrad Concierge application on your mobile phones as it will truly complement your stay. Through the application, I was able to ask for extra amenities (at no charge), turndown service, room cleaning and room service. The weather was amazing for the period that I was in Bali. I was blessed with blue skies and strong sun for every single day I was there. The view from the balcony was pretty decent but it's worth noting that there are no rooms that are closer to the beach than the one I am in. The resort itself was truly sufficient for me and where it is located really deterred me from going outside. I had previously intended to head down Seminyak for the cafes and restaurants but I decided to spend all my time in the property instead. The swimming areas are open 24 hours and to my surprise, they are also heated to a really comfortable temperature (especially at night) to make swimming a pleasant experience. Free WiFi is readily available around the property and it was also accessible via my room. According to the general manager of Conrad Bali, the wireless internet is a new addition and has only started rolling out across the property not too long ago. That being said, it is worth remembering that Hilton usually offers only paid internet (free for Gold and Diamond members) across most properties so I won't be surprised if internet access becomes chargeable in the near future. I had most of my meals in the hotel itself and have found the Eight Degrees South restaurant to be great on the first day but really mediocre on the second. When I visited on a Saturday, I was presented with the most amazing Beef Tataki starter but I was truly disappointed when I visited it on Monday as it failed in both presentation and taste. For snacks and other miscellaneous items, there's a convenience store (Alpha Mart) across the road from the main entrance. I tried two restaurants outside of the hotel that were within 3 minutes walk. Pitanira - food was really below average but it was very affordable. I would not recommend it at all. Queens of India - serves pretty decent Indian cuisine at an affordable price. Many good reviews from travelers to the area but I thought the food was rather salty. Book before 10 April 2014 and enjoy 30% off participating resorts in Asia Pacific. The Renaissance Johor Bahru Hotel is the only property under the Marriott portfolio in Johor Bahru, Malaysia and it offers great value for Marriott Bonvoy members! Check out my review of the Club Room as a Marriott Bonvoy Platinum Elite member. As a DISCOVERY Loyalty Black Member, I was upgraded into a Pool Villa at the Alila Ubud which comes with expansive views of the valley beneath it. The food is excellent but the property certainly shows sign of age. Read my review to find out more! The InterContinental Singapore Robertson Quay is quite possibly the most beautiful IHG property in Singapore. Opened in late 2017, this property is located in a quieter area of Singapore (which is quite popular amongst expats) and the rooms (albeit small) are luxuriously-furnished. When I stayed in a Club Riverview Studio King room last year, I thoroughly enjoyed my stay and I think it is safe to say that this property has the best Club InterContinental Lounge (with a proper cocktail menu) in the country. The InterContinental Hanoi Landmark72 is the highest hotel in Hanoi. I stayed in one of the best suites at the InterContinental Hanoi Landmark72 during my visit - the Royal Suite is the second largest suite in the property (just one category below the Presidential Suite) and it features 148sqm of beautifully-appointed space. My favourite way to get from Singapore to Bali is on Singapore Airlines Business Class (the 787-10 Dreamliner has a great regional Business Class product that is ahead of its competitors). Alternatively, you may consider flying on KLM’s 777-300ER Business Class product if that timing or price point suits you better. With all that being said, I usually fly in to DPS on SQ942 and there is usually only a short queue at immigration (just make sure you head to the line first before going to the bathroom). After I collected my bags, I was met with a private driver from the HOSHINOYA Bali who then escorted me to the car. Read my review of the Jalak Villa-type here in this luxurious Ubud property! After obtaining Platinum Elite status on the Marriott Rewards (soon to be called Marriott Bonvoy) program, I have been a lot more eager to try out properties because the 4:00PM guaranteed late check-out benefit is something that I value a lot. Therefore, when I visited Bangkok late last year, I decided to stay at the W Bangkok which is somewhat connected to Chong Nonsi BTS station. Check out my review of the Spectacular Room here! I have been to Melbourne at least ten times now (I went to school in Brisbane and spent plenty of weekends here in Melbourne because there was just so much more to do) and honestly, I have not actually noticed the InterContinental Melbourne previously - I knew it existed but I just wasn't sure where it was. Room rates were pretty high the weekend that I was visiting so I decided to make use of my InterContinental Ambassador Free Weekend Night Certificate on this stay. Read my review of the Executive Room here in the InterContinental Melbourne The Rialto. After getting my hands on an Accor Plus membership a few months ago, I started looking at the Red Hot Rooms rate (exclusive to Accor Plus members only) across all participating hotels in Asia-Pacific and actually found some ridiculously cheap rates in Singapore on some weekends. As such, since I was going to have lunch at Kopi Tiam in Swissotel The Stamford one weekend, I decided to book a room for a staycation anyway. I stayed in one of the newly-renovated Premier Harbour Rooms and I truly loved it! The Ritz-Carlton, Millenia Singapore is one of the most iconic luxury hotels in Singapore and it was also voted as one of “The World’s Sexiest Bathrooms” by the Tatler Cunard Travel Guide. To showcase the various art pieces within the hotel as well as to promote great appreciation towards art and science, the property has introduced the Canvas of Views room package which comes with overnight accommodation, daily club access, a pair of tickets to the ArtScience Museum as well as various other perks that you can enjoy during your stay.